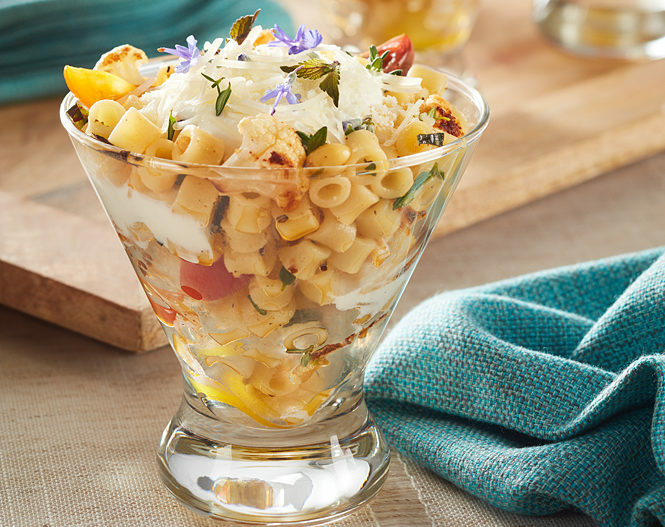 Barilla America Chef Yury Krasilovsky improvised these clever savory parfaits that are perfect for parties and receptions. Use any attractive glasses or small bowls to show the colorful layers. For passed hors d’oeuvres, use 1-ounce shot glasses. Cook the Barilla® pasta for 1 minute less than the time indicated on the package. Drain pasta and drizzle with some olive oil to prevent from sticking. Place pasta flat on sheet trays or hotel pans and cool in a blast chiller. Alternatively, cool it down in a walk-in cooler. Store in zip lock bags or sealed plastic container; refrigerate and use within several hours. Toss the cauliflower with oil and season with salt and pepper. Spread on a sheet pan and roast at 375 degrees until browned and slightly charred. Set aside to cool. Stir together the ricotta and yogurt and season with salt and pepper. In a large bowl, combine the pasta, cauliflower, tomatoes, garlic, pine nuts, lemon juice, extra-virgin olive oil, and 3/4 of the herbs. Season with salt and pepper. Layer 4-ounce glasses with 1 oz. pasta salad, a 2-tsp. dollop of ricotta, 1 oz. salad, another dollop of ricotta, 1 oz. salad, then garnish with Parmesan, romano, and the remaining herbs.